I felt happy to find indications that the Great Pyramid and Great Sphinx may have been built during the time Atlantis was supposed to have existed. I had also seen for myself that a very advanced civilization may have built these ancient ruins. Hence, I believed it possible that the images painted on the walls of the pharaohs’ tombs in the Valley of the Kings might illustrate the ancient Egyptians’ legendary recollections of that time. I also hoped that these tomb images might illustrate my memories of Atlantis. Therefore, our next stop was the pharaohs’ tombs in the Valley of the Kings. Many tourists who visit Egypt travel to the Valley of the Kings on a cruise ship that sails down the Nile to Luxor. We would not have the time to take a leisurely sightseeing cruise along the river. We flew to Luxor instead. When I think back on it, I am again amazed that everything worked out so well for us. As Hani had promised, his cousin in Cairo owned a travel agency, and he had arranged our travel. As this was an in-country travel agency, we naturally flew Egypt Air. I found our flight to be a new experience. Most of our fellow passengers were Egyptians. And, they were almost all men. Except for a couple of young women tourists who traveled with husbands or boyfriends, our fellow passengers had swarthy skin, jet black hair, and looked like they might be relatives of that dashingly handsome and famous movie actor of Dr. Zhivago fame, Omar Sharif. It was quite a difference from the blondes, brunettes, and blacks of the United States. In addition, Peggy and I found it just a little bit disconcerting that all the signs in the plane such as “Exit” and “No Smoking,” were written in large graceful Arabic characters, and, in equally large and prominent letters, in Russian. Under the Arabic and Russian we found very tiny English lettering. This could only mean one thing. The Egyptian aircraft on which we flew was not an American plane. It was Russian! Nonetheless, the flight was lovely—comfortable, enjoyable, and delightful—everything a person would want in commercial airline service. Because we flew at night, the lights in the cabin were dimmed. Although Peggy and I should have felt apprehensive or even sleepy, because it was such a new situation for us, we felt like children who have been allowed to stay up later than our usual bedtime. We talked with energy and animation over the roar of the engine for the whole flight. We arrived in Luxor in the middle of the night. The men with whom we had shared our flight deferred to us with consideration and politeness because we were women. Our driver waited for us on the tarmac in the spotlight created by a light on a tall pole. This was not a big bustling airport. We walked off the plane, down a moveable ladder, and picked our luggage out from a pile on the tarmac. All the other passengers scattered, leaving Peggy and me alone with the driver who loaded our luggage into his vehicle, which he had driven onto the tarmac. I felt grateful to have Peggy’s companionship, thankful she had offered to come with me. It must have been quite late at night because we did not pass a single other vehicle on what seemed like a long drive from the airport to our hotel in Luxor. Both the Temples of Luxor and Karnak are located on the East Bank of the Nile. However, most of the burial tombs of the pharaohs are located on the West Bank, many of them in the Valley of the Kings and the Valley of the Queens. The ancient Egyptians chose to bury their dead on the west side of the Nile because the sun set, or died, in the west. As we drove from the airport on the West Bank to our motel in the city of Luxor on the East Bank, we crossed a bridge over the Nile River. Everything—the bulrushes along the water, the moonlit road and the black water itself—felt quiet and still as if we drove through a museum display. Anchored in the dark water below, I saw the lights of dozens of cruise ships. Probably hundreds, maybe even thousands, of tourists slept in these floating motels. It all looked so crisp in the moonlight. The air smelled fresh but dry even when we crossed the bridge over the river. In the headlights of the car, everything looked brown, including the low scruffy bushes along the road. As we drove along in this unfamiliar land, I realized that, for the first time, we were totally disconnected from the safety of our umbilical connection with Mohga. We had felt nurtured and safe with her. Now, we were on our own. What would we do if there was a problem with the hotel? Who would we call? Who would help us? Who would care? Compared to Cairo, Luxor is a small town. Once inside the town, we drove along an empty street that paralleled the Nile. In the darkness, we could only see sleeping buildings on our left and a row of palm trees on our right, which I assumed lined the river. Everything in this desert area looked brown, even in the city. As we approached the hotel, golden lights that beamed through the glass doors beckoned to us. When we checked into the hotel, the attendant gave us the choice of paying a slightly higher fee for a room with a view of the Nile. We opted to pay the higher fee. It turned out that I wasted my money because I never inhabited the room in the daytime when I could have seen the Nile from my motel room. Instead, I spent all of my time exploring the nearby ruins. As prearranged, the next morning our driver arrived before first light. Streetlights at the hotel entrance lit up his car parked by the curb. The sky had lightened to a dark gray by the time we drove out of town. The driver seemed especially anxious to get to the entrance of the Valley of the Kings as quickly as possible. Not having been there before, I did not understand why he appeared to be in such a hurry. I could only think that he wanted to get us to the antiquities site while the air temperature was still comfortable. The Valley of the Kings is an area rich in ancient Egyptian artifacts, located between the towns of Luxor and Karnak. Many pharaohs who lived from around 1540 to 1075 B. C. were buried in this area. Of these pharaohs, the best known to modern people is probably Tutankhamen or King Tut. Nobles and their families were also buried in this area, as well as pets. The majority of the tombs have been ransacked by grave robbers, Tutankhamen’s to a much lesser extent than others. Because he was a minor king during his lifetime, experts believe that the treasures found in his tomb are merely a glimpse of the amazing artifacts originally contained in other pharaohs’ tombs. Although several tombs are closed to the public, the extensive abundance of Egyptian monuments leaves a plethora of tourist-friendly places. Nearby is another area of ancient Egyptian artifacts named the Valley of the Queens, since it was the area designated as the burial ground for important queens, such as Queen Hatshepsut. The drive from the hotel to the entrance of the Valley of the Kings site appeared to be much shorter than the drive from the airport to the hotel. Once at the entranceway we quickly purchased our tickets. Only a few other people, all men, queued up with us at the ticket window. Perhaps they were all tour guides. As I turned from the ticket window, I saw something I had not noticed in the darkness of the early morning shadows. Crouched under the overhanging rooftop of the building that housed the ticket sellers loomed an army truck with a gun turret on its roof. The gun pointed at the parking lot. A couple of military policemen, armed with machine guns, hovered at the ready nearby. The tank-truck at the Valley of the Kings entrance. Until this moment, I had dismissed the number of military police in Egypt as equivalent to the number of policemen we have in the United States, believing that I had become so accustomed to police in our own society that they have become transparent to me. However, the tank-at-the-ready produced a shock that made me realize that the situation in Egypt is much more dangerous than on U.S. streets. Of course the pyramids and the many other precious archeological sites in Egypt attract throngs of people from all over the world, so there is need for heightened security. At the time, I did not know that 58 foreigners had been massacred by terrorists at the Valley of the Kings in 1997. No wonder John had been wary of visiting the land of the pharaohs. No wonder the Egyptian government needs to keep a tank-truck and machine-gun toting soldiers at the ready at the Valley of the Kings. I appreciated that they did. The sun broke through the palm fronds at the horizon and at the same time, I heard the grumbling of a bus engine. I turned to observe the stinking behemoth swing into the dusty road alongside the parking area. The tourist bus took its place behind three cars parked in front of the closed entrance gate. Our driver scurried up to Peggy and me. He motioned anxiously to us, begging us to hasten into his car. At first I could not understand why he was so anxious. As our driver frantically motioned toward his car, I saw the reason for his alarm. Rumbling on the road from the Nile River, a convoy of tourist buses bore down upon us, the fumes from their diesel engines causing dust to plume in clouds along the road. I realized that they carried the hundreds of tourists who had spent the night on the dozens of cruise ships anchored in the Nile. I felt thankful that our driver knew to get us into the queue ahead of the buses. If we had had to wait for all the people on the buses to get off, our delay before we could enter the archeological site might have become interminable. By the time we got into the site the desert sun would have been frying us alive. The tall desert cliffs in the Valley of the Kings. We ran to his car and made it to the entranceway before the buses. We were some of the first people to enter the premises. Ahead of us, we saw walls of barren desert cliffs, which surrounded a valley. Along the floor of the valley, dry gravelly pathways wound from the entrance of one tomb to another. As I walked through the gate, I saw a sign saying that the use of flash photography was prohibited inside the pharaohs’ tombs. I felt happy that I had consulted a guidebook before I left the United States and so knew to bring film and lenses suitable for low light photography. Through research, I had learned that many of the images I sought could be found in the tomb of Thothmose III. Therefore, aware that the desert sun rose steadily in the sky, Peggy and I passed the crowds moseying along from tomb to tomb. Instead, we used the map of the Valley of the Kings in our guidebook and headed straight to the entrance of King Thothmose III’s tomb. As king of Egypt, Thothmose III brought great wealth to the country. He conquered Syria and most of the Euphrates Valley. He was the son of Thothmose II and a minor wife, Isis. Although Thothmose III became king when his father died, he had to share the position with Thothmose II’s royal wife, Hatshepsut. During Hatshepsut’s approximately 22-year reign, Thothmose III had very little power. However, after her death, Thothmose III ruled Egypt for the duration of his life. Peggy and I knew that once the crowds arrived, the atmosphere in the tomb would become increasing warmer, both from warm bodies and from the gain in heat from the relentless desert sun. In addition, I did not want to have to deal with people standing in front of the images I wanted to photograph. I am happy that we rushed ahead because of a detail I had not anticipated. Thothmose III’s tomb has a false floor built about a foot high above the original stone floor. My guess is that this wooden platform is built to keep the many shuffling feet from stirring up dust in the enclosed space. Therefore, instead of walking on the actual floor of the tomb, visitors walk on this false floor made of wood. It looked somewhat like an indoor boardwalk. Although the wooden floor created a pleasant walking surface, I had not anticipated the bounce created by the wooden planks. Once crowds started to pour into the tomb, I found it increasingly difficult to take photographs since the wooden platform bounced as the visitors tramped through the manmade cave. Since the walls of the tomb were lit with only one row of fluorescent lights placed at the level of the false wooden floor, the paintings were not lit as well as I had hoped. Even with my fast film, I needed a very long exposure time. With all the people bouncing on the wooden floor, I could not keep the camera steady enough for a long exposure no matter how tightly I jammed my elbows against my sides or how long I held my breath. Even when I held the camera like a rock, the floor beneath me caused the image to bounce. When I looked through the viewfinder to focus the image it appeared as if I stood on a trampoline. That first hour or so in Thothmose III’s tomb, during the time when Peggy and I almost had the tomb to ourselves, was the best. I saw many images that corroborated my memories of Atlantis. 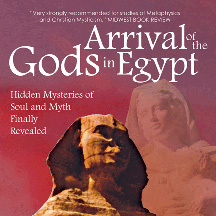 Find out more about Arrival of the Gods in Egypt.